Bestekloza > Commercial kitchen equipment suplier > How design forms the backbone of every commercial kitchen equipment service? Opening a new restaurant depends on a number of factors and circumstances. One of them is to manage a big and practical space where all your customers can eat, enjoy their food and appreciate it. 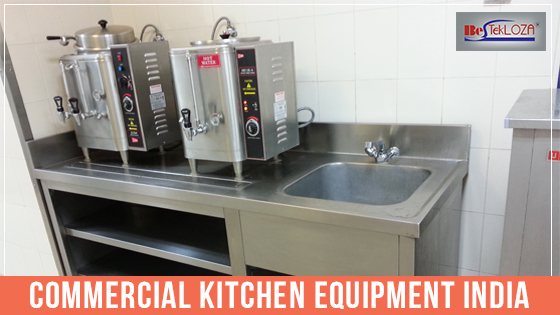 But while an added space is just as valuable for your eatery, having good quality, commercial kitchen equipment Kolkata is also important. The kitchen is an integral space for every eatery where most of the activities take place. If this is not structured in a functional way, the richness and These the value of the kitchen will languish. This is why the restaurant owner should always search for reliable and durable kitchen equipment and services. A dependable receiving area : In order to cook food inside the kitchen, you have to accept truckloads of poultry products, meat, fruits and vegetables, and dairy items. This gathering segment is where you can gain the maximum. It also covers the other segments like soft beverage refreshments which are passed. You must also be able to estimate the results and measure the after-performance. Ensure whether the products need to be refrigerated or stored. This points will ensure an efficient supporting system so that there is no food spoilage or waste food items. You can also gather more knowledge online for better analysis and optimization. Purchasing a cold and dry food storage system : These are available from any trustworthy kitchen equipment supplier in India. To make the eatery more business-like and constructive, commercial food storehouse can be very helpful. This can be both for cold and dry food items. You should take the measurements of the area first where you will make the storage space. • How much food will typically stay inside a warehouse? • How large will be the kitchen? • How often will you get the distributions? • How is the food served- regular or a weekly basis? • What size of the room can be rationally accommodated while sustaining kitchen work at the same place ? If you plan to set up cold storage, you will need refrigerators, freezers which come in different assortments, dimensions and preservation options. Shop for those which will fit your budget adequately.For a dry storehouse, proper cabinets, shelves or tin racks have to be set up which is possible if you reach the needed strength code. Food preparation period : You have to formulate a special time period for this. Once the food materials are securely collected, one has to draft a meal preparation time. You have to decide how to install meal preparation within a commercial kitchen gallery. • Do the storage and preservation need to resemble a meal prep area? • Will having a blending or refrigeration system be of advantage? Every kitchen space should have a quick passage that can give access to major kitchenette needs. A prep suspension can accommodate all these requirements. While emphasizing on good equipment and structuring, you can rely on “Bestekloza” which is a numerous commercial kitchen appliance manufacturer.